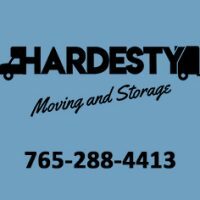 HARDESTY MOVING & STORAGE, IN BUSINESS SINCE 1920. Mention our website for 10% off! I can’t say enough good things about Hardesty Moving & Storage. Ricky was prompt with my quote, and was very thorough. I knew exactly what to expect from his crew, but the exceeded my expectations! I am amazed at the amount of my large/small items they were able to wrap and pack within a short period of time. Not a single item was broken, misplaced, or damaged! I will always use them! Hardesty Moving and Storage was awesome! Extremely cautious, quick and conscious of my things. Genuine experts, and at a good cost. I exceedingly suggest them! This was my 2nd moving experience with this company. I highly recommend using them. The owner and his crew are awesome people. Willing to help in any way they can. My 2nd move was a difficult one for the owner and his hard working crew. They worked through it like champs. Wonderful people. I could not be happier. Would most definitely call them again!! Good pricing. Good service. Would use again.